What are narratives and how do they work? Are you aware of the narratives invented, incited and regurgitated by the media? Are you cognizant of the narratives spouted by political pundits, both Left and Right? Are you wary of the narratives taught by popular theologians? Can you resist the narratives mass-marketed by clever advertisers and Hollywood studios? These narratives become so entrenched in the civic consciousness that it is considered heresy for you to challenge them. In America we are currently witnessing glaring examples of narratives in action. The media is delivering an onslaught of narratives in this unprecedented election season. Political “spin” daily conjures up new narratives about candidates—both pro and con. These rhetorical flames are fanned to get more ratings. Scrutinize the media working—not as objective reporters and observers—but actually inventing new narratives, overstating facts, sensationalizing sound bytes, taking words or events out of context, showing only parts of the story, and by omitting unsavory facts that might tarnish their favorite candidates. Witness the barrage of simplistic slogans and repetitive "attack ads” ad nauseum. When a narrative is repeated often enough it gains credibility and people start to believe it as fact. Think of it as planting a seed that takes root. Some readers will recall a classic narrative in American politics, the image of President Gerald Ford as stumbling and bumbling. 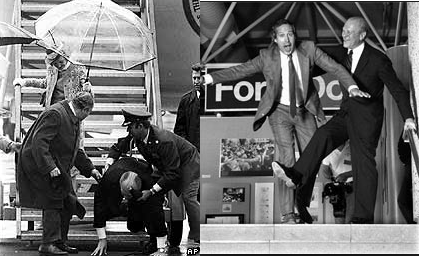 The press then began to hunt for instances of any misstep, and then the comedians began to satirize it. This would forever tarnish the image of this president in the public consciousness. Narratives can so take root that they revise history. Left, Pres. Ford stumbles. Right, comedian Chevy Chase satire. Narratives are a form of propaganda, a very effective means to alter people's worldviews. This is the whole intent. Not only that, but narratives begin to police people. If you speak or act outside the narrative lines you are penalized with negative labels, and punished with ostracizing, ridiculing, mis-characterization, name-calling and worse. Much worse. It takes courage to live and act against the prevailing narratives. The progressively accommodating church has also developed narratives. These narratives are rapidly replacing the Scripture as solid Truth. They are designed to desensitize people into adapting to and adopting the postmodern culture. 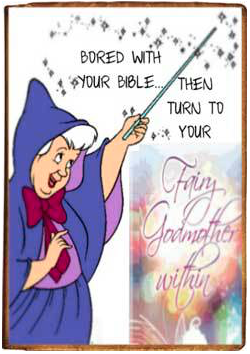 These narratives can be found in the revised Bible stories found in new Hollywood-ish movies, reinvented theology based on sensational new revelation, marketing slogans developed by popular authors (e.g., “purpose-driven”), recurring themes pounded out by evangelical media outlets (“America is a Christian nation”), popular cliches proffered by swaggering speakers on lucrative conference circuits, and dumbed-down lyrics pounded out by raucous musicians under the strobe lights. Postmodern evangelical narratives serve as a “better framing story... a revolutionary vision that could change everything,” said Brian McLaren in his provocatively titled book Everything Must Change (p. 6). In fact, evangelical leaders are brazenly using sophisticated psycho-social marketing tools that enhance their narratives to manipulate both theology and politics. For example, see the previous post about a “great outpouring of wealth,” a potent narrative that caters to covetous lusts. Similarly, eschatological narratives prey on people's fears. These narratives supplant the simplicity of the Gospel. These new “framing stories” provoke Christians to salivate when the narrative Pavlovian bell rings. In fact, the psychology of narratives reveals that people are very easily manipulated into believing slogans and “spin,” carefully contrived stories, fabricated fables, planted stories, etc. Narratives provoke potent imagery by the vivid stories they tell, which then become durable myths implanted in the brain. When enough people buy into these new narratives it results in a paradigm shift—which is the grand intention. The scheme is for the overwhelming masses of people to start thinking along the lines of the new narratives. What happens when people buy into these narrative myths? They disconnect their intellectual curiosity, they shut down their cognitive questioning, they cease practicing discernment, they stop looking for the bigger context, they lose the ability to have a rational and cogent discussion, and they stop acts of compassion for different others that is required in the Gospel. 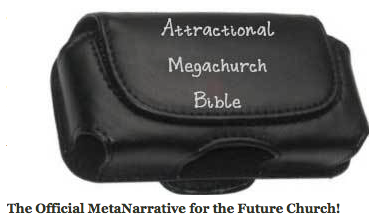 In fact, many begin to read everything through the lens of the new narrative, even their Bibles. It is difficult to deconstruct these strongholds in the mind. The Greek word translated “air” (“ah yer”) used in the phrase “the ruler of the kingdom of the air” carries with it the notion of an “atmosphere.” It also can refer to the unconscious nature of our breathing. The intentional creation of a toxic atmosphere can bring about as many, if not more, casualties than bombs and bullets. 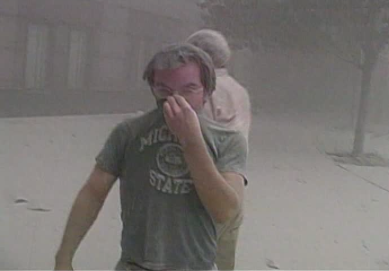 In September 2001 when I was part of a team of chaplains who responded to the terrorist attacks on the World Trade Center, I breathed the toxic air at Ground Zero and as a result I now have a number of chronic breathing and reflux problems. I am screened annually to see if cancer has developed. The air was full of carcinogens and other toxic material, but I was unaware that what I was breathing then would still be affecting me today. There is an atmosphere in the church today that is toxic. This climate of skepticism and questioning and doubt comes not from our Heavenly Father but I believe from “the father of lies.” How has Satan managed to get a whole generation of Christians confused as to the trustworthiness and reliability of their Bibles? I suggest that the “prince of the power of the air” has used state-of-the-art techniques. He has not changed his basic orientation. 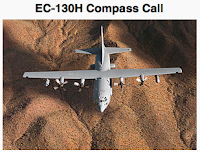 The EC-130 Compass Call aircraft attempts to disrupt enemy command and control communications and limits adversary coordination essential for enemy force management. The Compass Call system employs offensive counter-information and electronic attack capabilities in support of US and Coalition tactical air, surface, and special operations forces. The EC-130H was used extensively in the Gulf War and Operation Iraqi Freedom, disrupting Iraqi communications at both the strategic and tactical levels. It has also been used in Operation Enduring Freedom in Afghanistan. In light of what I wrote about the importance of the reliability of instruments, I wondered, “What if the enemy of our souls has deployed a similar offensive counter-information attack? What if his purpose is to destroy our capability to use our compass? His weapon would be intentional offensive counter-information. Could that entail intentional information designed to be “counter” to what we have been taught for centuries about Jesus—to get us to mistrust what we used to rely on as being fixed truth? Would the devil go on “the air” to do it? Think now of the phrase from Ephesians, “prince of the power of the air” in terms of an on air broadcast of information-or misinformation. Is the devil smart enough to deliberately create an atmosphere by means of deliberate relentless “offensive counter-information”? What used to be journalistic integrity has given way to a ruthless pragmatism. 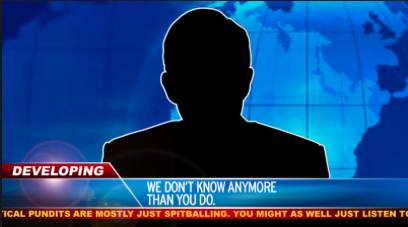 News anchors are now primarily media celebrities with their own “brands.” Their “reporting” of the news is suspiciously similar. I believe it was Rush Limbaugh who first began to produce what he called “montages” of the day’s news coverage by the major media outlets. After listening to these compilations it became painfully clear to me that a set of talking points was released. In many cases the phrases used and even the very sequence of sentences each news anchor read was identical. Isn’t it interesting that we now call them media outlets rather than news broadcasts? When I hear outlet I think outlet mall—a place where stores compete for your attention to sell you something. It has been demonstrated to my satisfaction that talking points have taken the place of investigative, unbiased reporting. The facts don’t matter. The optics and the impression the news teams have crafted are all that counts. Many of these celebrity talking heads are former political consultants. Bob Beckel who ran Walter Mondale’s presidential campaign recently appeared [2014, ed.] on a John Stossel special with Ed Rollins who ran Ronald Reagan’s campaign. 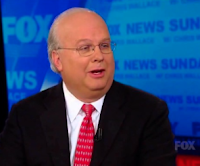 Karl Rove, “The architect” of George W. Bush’s campaigns also appeared. The show was alternately fascinating and depressing. It was a behind the scenes exposé of what really goes on at crucial moments in political campaigns. They frankly discussed how campaign events that seemed “spontaneous” were in fact scripted parts of a clearly defined narrative crafted by paid professionals—experts in manipulating public opinion. After the elections are over, many of these professionals are rewarded with celebrity status and proudly admit that they knew they were often promoting and defending known lies. When confronted with the intentional deception and the manipulative nature of it all, they always come back to the same rationale. “It works.” A carefully constructed narrative, irrespective of its truthfulness, can be, and regularly is, sold to us on a daily basis. That this occurs in the realm of politics does not shock me. That it now takes place in the realm of theology both shocks and saddens me. Think about it for a minute. In the post-structuralist approach to textual analysis, the reader replaces the author as the primary subject of inquiry. This displacement is often referred to as the “destabilizing” or “decentering” of the author, though it has its greatest effect on the text itself. Without a central fixation on the author, post-structuralists examine other sources for meaning (e.g., readers, cultural norms, other literature, etc.). These alternative sources are never authoritative, and promise no consistency. One of the principal thinkers who shaped post modernism and its ultimate influence on the development of Narrative Theology is Jean-Francois Lyotard. A French philosopher, sociologist, and literary theorist, he is well known for his articulation of postmodernism after the late 1970s and the analysis of the impact of postmodernity on the human condition. He was co-founder of the International College of Philosophy with Jacques Derrida, François Châtelet, and Gilles Deleuze. Lyotard studied philosophy at the Sorbonne. His master’s thesis, Indifference as an Ethical Concept, analyzed forms of indifference and detachment in Zen Buddhism, Stoicism, Taoism, and Epicureanism. 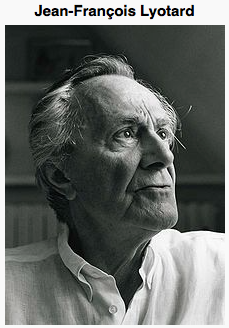 Lyotard was an avowed socialist whose involvement with the first wildcat strike in France almost brought down the government. I find it fascinating that a Socialist who was a key figure in the aforementioned uprising studied Stoicism and Epicureanism—the same two schools of thought that Paul confronted at Mars Hill in Acts 17. Narrative Theology owes some of its philosophical underpinnings to a man having some (albeit remote) ties to ancient philosophies that Paul showed to be fallacious. Think back to what I said about the devil being a master tactician. It is not surprising then, that Narrative Theology leaves one with more questions than answers. I believe that labeling the revelation of God as a narrative is taking license in such a way as to possibly incur the wrath of the God whose Word is being co-opted by literary technicians. Narrative Theology owes its shift from relying on one author’s intended meaning to many meanings to writers like Roland Barthes. In 1967, Barthes published “The Death of the Author.” Barthes argued that any literary text has multiple meanings, and that the author was not the prime source of the work’s semantic content. The “Death of the Author,” Barthes maintained, was the “Birth of the Reader,” as the source of the proliferation of meanings of the text. There doesn’t seem to be any obvious reason why Jesus had to be born of a virgin. If he hadn’t been, then there would have been no New Testament “fulfillment” of Isaiah, but then nobody would have thought there should be one! I’m inclined to think “fulfillment” should be reserved for things that are more compellingly part of what God seems to have been doing. . . . While few today question the validity of historical-critical exegesis, many interpreters now challenge the view that a text has only one meaning, insisting that the meaning of a text depends on the questions we ask. In practicing a narrative theology, the overarching conviction is that the revelation of God is a story: the story of the creator God, at work in Israel, to redeem and reconcile the world through the story of Jesus. Part of what this means for me is the possibility of transformation, reconfiguration, and even leaving behind of earlier moments in the story as later scenes show us the way forward and, ultimately, the climactic saving sequence. Instead, I propose a multiple-reading strategy. Allow the text to mean what it meant in its first context, as much as we can determine this. Do the historical critical work that sheds light on why, for example, an eighth century BC audience would formulate matters just so—and then recognize the freedom of later readers to reread those texts differently in light of later events . . . What I propose for reading the Bible itself also pertains to reading it for our communities. We are part of a long story. This means that the retellings will involve some measure of transformation. And this is, itself, faithful and living renarration of the story of God. This I would offer is dramatically different than the systematic theology that used to be a staple in most evangelical seminaries. Quoting the author of Cultural Software: A Theory of Ideology, J.M. Balkin, Kirk amplifies his line of reasoning. We attempt to understand what is happening in terms of expectations we already possess. We recognize patterns of behavior as meaningful in terms of patterns we are already familiar with. We create a story about what is happening based on stock stories—expected sequences of events—that already lie to hand. Second, the expectations that frame our understanding create the possibility of deviations from what is expected. These deviations call for explanation, and we employ stories to explain them. Yet narrative is not only a framework for making behavior meaningful; it is also a framework for understanding the psychology of others and attributing mental states to them. Narrative structures organize our use of psychological concepts like purpose, desire, intention, and belief. When we explain people’s behavior through narratives, we simultaneously ascribe purposes, desires, intentions, and beliefs to them. 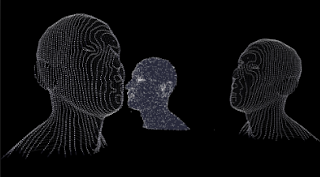 Like other forms of cultural software, new stories are created from older ones through bricolage. Parts of stories or scripts may be combined or grafted onto each other to form new ones. As a result, many of the stories and scripts that we possess bear structural resemblances to one another, even if they are used for widely different purposes. In the same way, we should also expect that many narratives and scripts widely dispersed in the larger culture will be strikingly similar, because they are common descendants of older stories and scripts that have been adapted to new ends. Who then, I ask, is deemed qualified to take a scissors and paste approach to what purports to be the words of the living God? What adaptations are acceptable? What criteria beyond self-appointment and literary/critical training give some the right to be the very arbiters of God’s Revelation? To what ends might the stories they craft be manipulated? Dr. Balkin makes the important observation that some will have no qualms about constructing a narrative for political and legal purposes. Political and legal rhetoric gains much of its power from these features of narrative framing. People naturally attempt to explain gaps in events for which they have no direct evidence, or events that they do not wholly understand, in terms of familiar stories and scripts. Once they have settled upon a story to frame events, it can exercise great power over their imagination, leading them to make unwarranted inferences and prejudicial judgments. Trial lawyers have long understood the power of narrative framing. They attempt to lay out a story of how events occurred during their opening arguments in the hope that the jurors will use the story to frame the evidence they hear. Getting the jury to accept one side’s story as the most plausible framework for the events of the trial is often tantamount to winning the case. That is because once a story is accepted, it is used to filter and organize all of the evidence subsequently presented. Like most people, jurors tend to discount or ignore evidence that does not fit their organizing story, and they will alter or simplify information so that it does conform. The implications of all this are sobering indeed because the intentional creation of a narrative by those familiar with its power to shape ideology, and those who are willing to craft a narrative for a desired ideological purpose, is dangerous. Joseph Goebbels comes to mind. The Nazi narrative was finely-crafted and meticulously implemented over time. His doctorate was in literature. His background was in journalism. The net result of his tortured parsing of words and meticulous crafting of a suitable narrative was the extermination of millions of human beings... the majority of whom were God’s chosen people. It appears the Devil is very skilled in Narrative manipulation. The more pervasive and powerful a form of cultural software is in understanding the world, the more pervasive and powerful its potential ideological effects. Narrative thought is an excellent example of this phenomenon. Because narratives are so central to our thinking, they create particularly compelling ideological mechanisms. Moreover, narratives produce ideological effects not only because they present a partial or misleading picture of the social world but because they are ways of intervening in the social world and of influencing the responses of others. Narrative structures do not simply reflect the world badly; they shape the world to their own distorted lens. They are not only illusion but prophecy. It is as if one could make one’s face become ugly by looking at it repeatedly through a funhouse mirror. 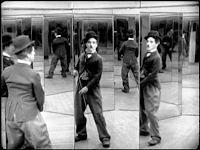 Indeed, the optical metaphors of distortion are entirely inadequate to describe the variety of ideological effects that narrative thought can have on the social world. I have for a long time now had the sense that the culture is bending the church far more than the church is influencing the culture. Check the catalogues and course offerings at many Bible colleges and seminaries and note how many textbooks and course descriptions have to do with social sciences, psychology, statistics, and management. Then try to find old catalogues of the same institutions, and see how many of those course offerings were Bible-based and reliant upon systematic theology and Church history. “The wedge that has been consciously driven between systematic theology and biblical theology over recent decades in influential circles is starting to bear very bad fruit. Exclusive emphasis on the Bible as storytelling has combined with a trendy cultural impatience both with the past and with the very idea of systematic theology, and this has provided fertile soil for the reception of the kind of ideas promoted by the scripture revisionists. I believe that some have taken Narrative Theology to mean that we must get our “stories” straight; not by consulting scholars who teach systematic propositional truth from an inerrant Bible, but rather from the consensus of opinions of an increasingly secular religious cooperative. Remember the purpose of offensive counter-information is to render a group helpless and confused, in preparation for the main attack. 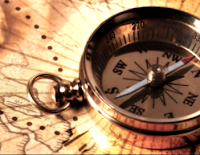 The desired product of an “old school” seminary was a minister who learned how to handle his compass. His systematic theology was meant to help him navigate the storms he was sure to face. Sadly, today it seems that the desired pastor/product for postmodern churches is a technician; preoccupied with polls and focus groups; slavishly adhering to the latest cultural phenomenon and desperate to be “relevant” at all costs. Once we relegate Scripture to a subset of ancient literature, and then devalue it to the point of being merely one of many metanarratives, it is inevitable that its supernatural claims to authority will be lost. Has the devil’s counter-information campaign succeeded? 1. F.F. Bruce, Commentary on Paul's Epistles to the Colossians, Philemon and Ephesians: The New International Commentary on the New Testament (Grand Rapids: Wm B. Eerdmans, 1984). 4. Emmanuel Levinas, Humanism of the Other (Chicago: University of Illinois Press, 2003), 11-12. 7. Narrative Theology and Transformed Meaning" (Storied Theology, Feb. 25, 2012, accessed Oct 10, 2010) http://www.jrdkirk.com/2012/02/25/narrative-theology-and-transformed-meaning/. 9. J.M. 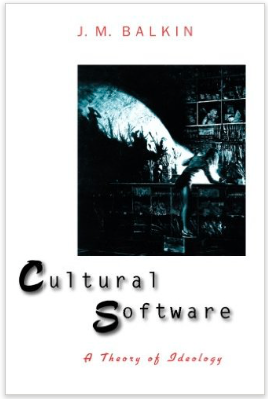 Balkin, Cultural Software: A Theory of Ideology (London: Yale University, 1998). 13. Desmond Alexander, "Is there a wedge being driven between Biblical Theology and Systematic Theology?" (Biblical Theology, Word Press, Nov 2008) accessed Dec 15, 2012, http://biblicaltheology.wordpress.com/2008/11/11/is-there-a-wedge-being-driven-between-biblical-theology-and-systematic-theology/. Some reformatting and bold emphases were added to this chapter for the purpose of blog posting. 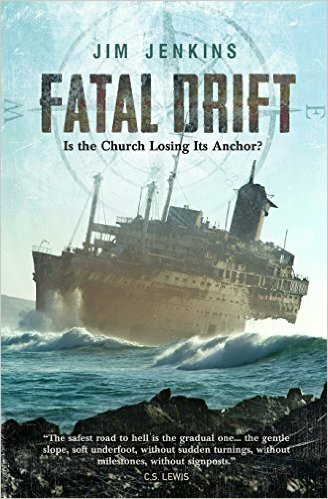 Read more from Pastor Jim's book here: http://herescope.blogspot.com/2016/02/fatal-drift.html Note: some of the men cited in his book have fallen into errors. Nevertheless, a discerning reader should be able to navigate this.